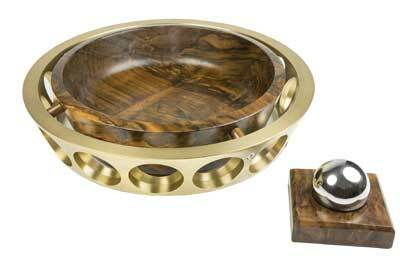 Walnut and brass alloy bowl, 300mm dia. x 80mm high. I was given these two bearings, which had come from our local MDF manufacturing facility. After spending a fair while in my shed, I decided what they could be incorporated into - and here is the result. Both the roller and ball bearing came off 200mm shafts, so were very heavy and packed with grease. Cutting through the opposite sides of the outer ball race with a 1mm thick cut-off wheel on my 115mm angle grinder enabled me to get the brass alloy cages out. Before I had cut all the way through each side, I drove in a small hardwood wedge to stop the race pinching back on the cut-off wheel and shattering it. 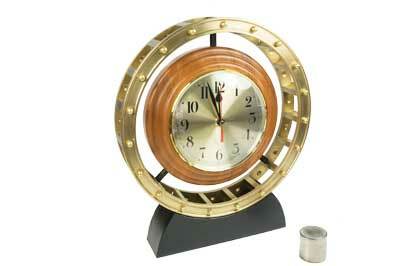 The roller bearing, which the clock is mounted into, has that circular band, which was held in place by a rivet that was all one piece of each of the 19 roller divisions. I centre punched the rivet heads and carefully drilled them out. I was then able to lift off this band and remove all the rollers. I set out the three screw holes in which the clock was to be fixed, then drilled and countersunk them. The 130mm diameter clock was fitted into a piece of western red cedar (Thuja plicata) with a base in New Zealand red beech (Nothofagus fusca), then painted black. I held the base unit in place with two 5mm socket head cap screws, which were drilled and tapped in two of the brass alloy divisions with the heads counterbored. The 19 brass 5mm dome nuts have short sections of 5mm threaded rod placed into each one, then 406 Loctite glue was added into the drilled out rivet holes. The walnut (Juglans regia) bowl was somewhat easier in terms of fitting to the ball bearing cage. I used the same process of cutting through the outer race, which allowed all 16 of the 48mm diameter balls to drop out. I marked out the four screw holes to fix the bowl in place, then made up a jig to hold the cage in position on my drill press. I was then able to drill and countersink the holes. The bowl has four Brazilian rosewood (Dalbergia latifolia) spacers, 19mm long, which are drilled for the stainless steel screws to hold the bowl in place. The polishing of this piece took many hours. I found it very difficult to sand down between the 19 roller bearing divisions, but finally got it to an acceptable sheen. Both bowl and clock were first given a couple of coats of Danish oil, followed by spray lacquer. The cages were lacquer sprayed as well - all done prior to assembly. Having an engineering background, I often like to combine the two elements of wood and metal, which, in this case, gives both pieces a real mechanical look, with the dark walnut contrasting so well with the brass alloy.